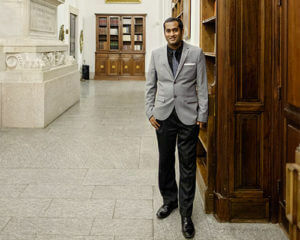 Selvanathan, a Theology graduate student, poses in the Ambrosian Library, one of Milan’s first public libraries, where he participated in a graduate research assignment this spring. Sight unseen and armed with faith, Anthony Selvanathan traveled more than 3,600 miles from his home in Hawaii after graduating from Chaminade University to pursue a Master of Arts in Theology at St. Mary’s University. Selvanathan felt that his journey was part of a calling: to use and expand his knowledge of religious studies to help people navigate their spiritual journey with God. “I’ve always been involved in ministry since I was a kid. My family has a strong commitment to the Blessed Virgin Mary, so coming to a Marianist school made sense. We look to Mary as a model we should strive to emulate,” he said. Soon after arriving at St. Mary’s, he had an offer to work with Todd Hanneken, Ph.D., Associate Professor of Theology, as a graduate researcher. Hanneken’s Jubilees Palimpsest Project uses state-of-the-art imaging technology that he developed to reveal writings in ancient books and manuscripts that have not been visible to the human eye for hundreds of years. In January, Selvanathan headed to Milan, Italy, where he spent five weeks working in the Ambrosian Library, one of Milan’s first public libraries, established more than 400 years ago. He joined Hanneken and other scholars, discovering and photographing erased writing in the Jubilees, a biblical text written around the time of Christ. Together, they stared history in the face. 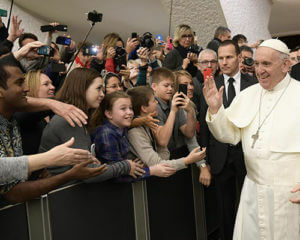 Anthony Selvanathan (far left) extends his hand to greet Pope Francis (far right) during a visit to Vatican City. For the aspiring theologian, it was inspiring to see Hanneken and other scholars pick up archaic manuscripts and translate ancient Greek and Latin. And, thanks to distance learning, Selvanathan continued his graduate course work while there. With history literally at his fingertips, class discussions came to life. “We would talk about something in class, like where St. Paul was martyred, and I could say, ‘I’ve been to that place. '” he said.